New Delhi: Hours after the Reserve Bank of India (RBI) signalled softer interest rates, the Indian government asked Parliament to approve an additional cash expenditure for the current financial year of Rs1.05 trillion, some 80% of the budgeted annual fiscal deficit, or gross borrowings. For the first time, the government also officially signalled that the Indian economy is poised to slow even as it dubbed such a pull back as “temporary". Meanwhile, the additional cash expenditure, which will most likely be met through new loans, is expected to be the last “supplementary" demand for extra expenditure, said a finance ministry official who didn’t want to be identified, implying that the Congress-led United Progressive Alliance may be factoring in a general election earlier than May when they needed to be held. The supplementary demand for grants, a post-budget approach by the government to Parliament asking it to approve expenditure not foreseen or difficult to pin down during the budget exercise, stood at Rs2.37 trillion. Of this, the government said only Rs1.05 trillion would involve “net cash outgo" and the balance would be met through enhanced revenue and savings. Though, for most part, the additional expenditure was incurred in bits and pieces over the last seven months, some economists said it would still push up aggregate demand in the economy. Along with RBI’s surprise cut in interest rates, the move is expected to mitigate the risks of the economy slowing too sharply. Though counter-intuitive, most economists were of the view that the step-up in government spending, largely financed through additional borrowings, will not result in draining liquidity from the system and thereby reverse the efforts of the central bank to progressively inject liquidity into the system over the last two weeks. 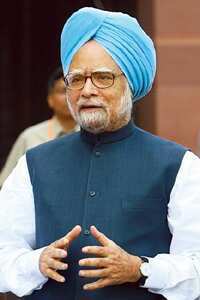 Speaking in Parliament, Prime Minister Manmohan Singh said: “We must be prepared for a temporary slowdown in the Indian economy. The precise impact is difficult to estimate at this point since the depth and duration of the global slowdown remain uncertain. Some estimates project GDP (gross domestic product) growth to decelerate to 7.5% in the current year. The most pessimistic estimates place it at no less than 7%. Our effort will be to minimize the negative effect of the financial crisis and, once the global situation stabilizes, to return to the growth trajectory of 9%." In early October, Arvind Virmani, the finance ministry’s chief economic adviser, had marked down economic growth in 2008-09 by 25 basis points to 8%. The major items of the cash outgo on supplementary demand came from fertilizer subsidy (Rs38,863 crore), farm loan waiver (Rs15,000 crore), enhanced pay to government staff on account of the pay commission recommendations (exceeding Rs20,000 crore) and rural employment guarantee scheme (Rs10,500 crore). Among the big ticket expenditures where there is no additional cash outgo was issue of oil bonds worth Rs65,942 crore to public sector oil marketing companies to subsidize retail prices of petrol and diesel. “It is a good counter-cyclical measure at this point in time, given the fact we have a serious financial crisis. You need to spend more, holding back does not arise," M. Govinda Rao, member of the Prime Minister’s Economic Advisory Council, said. The size of additional cash expenditure the government asked Parliament to approve was in sync with expenses incurred over the last few months, N.R. Bhanumurthy, associate professor at New Delhi-based Institute of Economic Growth, said. “I don’t see any surprises. It is in line with our expectations," he added. Most economists had forecast the Union government’s fiscal deficit for the year to be higher than the government’s budget forecast of 2%, or Rs1.33 trillion, of GDP. Fiscal deficit is a measure of the government expenditure in excess of revenue that is met through market borrowings. Economists who spoke to Mint did not expect the likelihood of the additional spending and consequent increase in borrowing by the government to impact liquidity and thereby interest rates in the economy. According to one of the them, as long as the banking system was compelled to hold government securities (through statutory liquidity ratio), there is unlikely to be an immediate impact of enhanced government borrowing on interest rates.